The global anti-collision sensor market is characterized by market players who hold experience in the automotive industry, states a new report published by Transparency Market Research (TMR). Some of the players in the anti-collision sensor market include: Robert Bosch GmbH, Denso Corporation, Continental A.G., and ZF Friedrichshafen. These leading players have a strong hold and strong distribution network in the automotive industry, which are helping them to continue with their dominant hold in the anti-collision sensor market. According to Transparency Market Research, the global opportunity in anti-collision sensor market will rise from US4.36 bn in 2016 to US$18.54 bn by 2024, expanding at a 19.8% CAGR between 2016 and 2024. In terms of volume, the market is projected to exhibit a 23.3% CAGR from 2016 to 2024. On the basis of technology, the market is expected to be led by radar sensors. The segment is also projected to expand at a high CAGR in the coming years on account of the sensor’s use in forward collision warning systems and adaptive cruise control systems. By end user, the aerospace and defense segment is leading. High investments by Russia and Germany on defense products and drones are increasing the potential of growth for the anti-collision sensor market. Asia Pacific is expected to hold lucrative growth opportunities in the anti-collision sensor market, owing to the high consumption of cars in China coupled with the decentralized transportation systems in Japan leading to an increasing number of automated rail networks in the country. In fact, China is close to the U.S. in terms of adaptation to automation and car consumption. Thus Asia Pacific is leading in the market for anti-collision sensors. Similarly, North America is another lucrative regional segment, with countries such as Canada, U.S., and Mexico driving the anti-collision sensors market. “Growing popularity of driver-less cars and installation of anti-collision sensors by a large number of car manufacturing companies are driving the growth of the North American anti-collision sensor market”, says a TMR analyst. The staggering increase in the number of vehicles on roads is one of the main reasons behind the growth of the global anti-collision sensor market. With increasing vehicles, the traffic is also growing and this has resulted in a number of human errors, causing accidents. Unpredictable circumstances are easy to occur when road planning is poor and traffic rules are absent, which is the case in various developing nations. However, with strict regulations for driver and vehicle safety in various developed nations such as the U.S., a conducive environment is created for the growth of the anti-collision sensor market. Other driving factors for this market include: advancements and improvements in sensors technology making them more reliable, cheaper, and capable of working in a variety of conditions. This is making anti-collision sensors an extremely appealing technology to car manufacturers, who are incorporating them in their new models of cars. Similarly, they are also attracting defense and agriculture sectors where UAVs are used increasingly, thus boosting the demand for advanced anti-collision sensors. 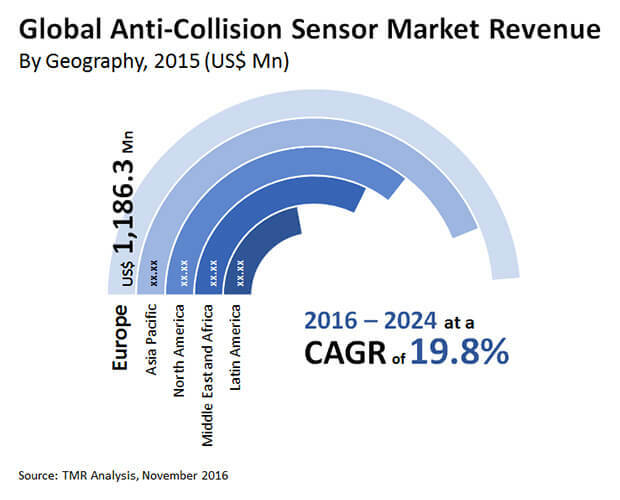 The anti-collision sensors market faces the challenge of not being completely feasible for small and medium scale car makers or companies in the developing regions. However, the situation is expected to ease up in the coming years as buyers from emerging nations are expected to show a higher demand for high-end luxury cars, on account of their growing disposable income. Car manufacturers are thus, setting up their manufacturing bases to Latin America and Asia Paciifc.